Vacation rental townhouse. 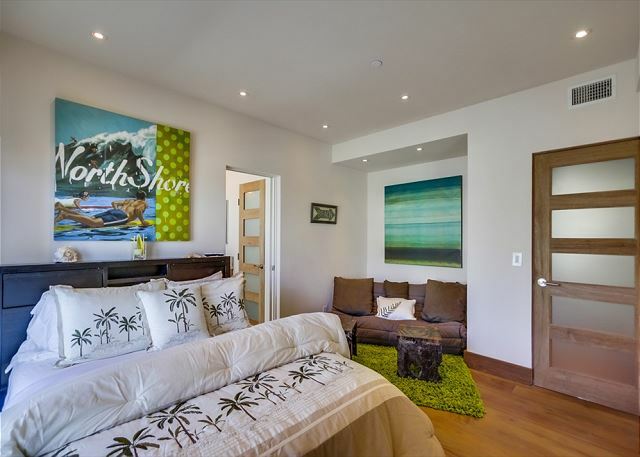 Sleeps 7, 4 bedrooms, 5 bathrooms. No pets allowed. May accept groups up to 8 people, please contact us to discuss. Reservations of 6 nights or less are approximately $1,200 per night. Reserve 7 or more nights to receive a discounted nightly rate of approximately $900 per night, excluding summer months. 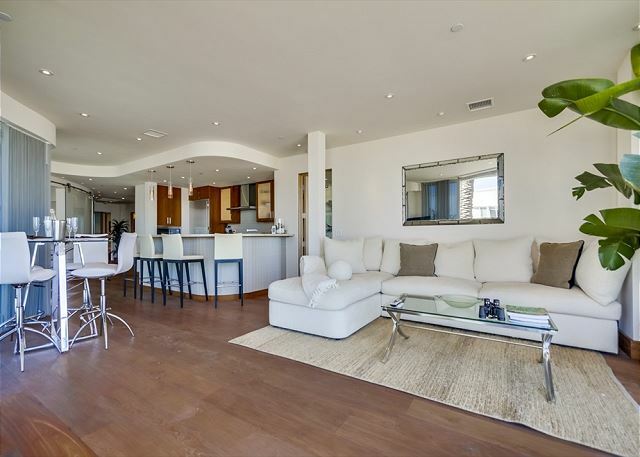 The owners of this truly spectacular first & second level townhome have graciously consented to allow guests to also enjoy the "opulent" lifestyle they designed and created to serve as their own personal second-home. 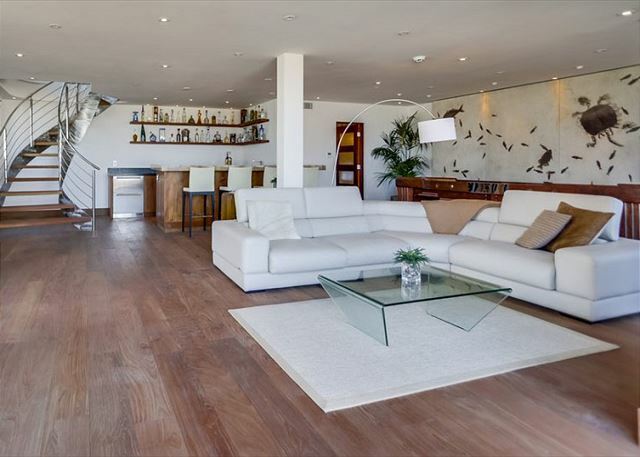 Thus far, they have spent multiple millions on the property in order to provide an unparalleled living environment that is constantly demonstrated by features which accentuate its soft elegance and beauty. 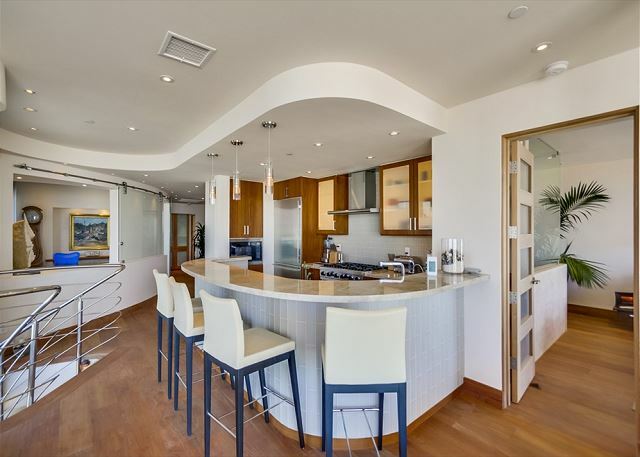 On the second level, the oceanfront living and dining area as well as the master bedroom have large retractable glass panels that enable the interior to truly embrace the ocean. 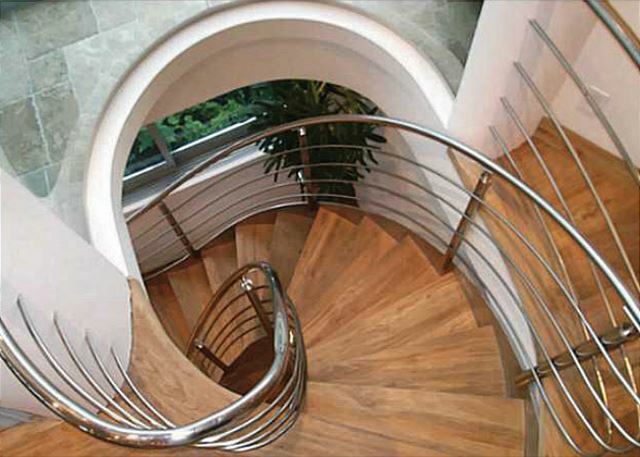 Lavish upgrades include the 150-year-old teak floors imported from Indonesia that also add a very special accent to the awe-inspiring spiral staircase that interconnects both levels. The kitchen and dining area offer comfortable seating for 8. All bathrooms have tankless water heaters providing never ending hot water. The most impressive and unique feature certainly has to be the huge entertainment & recreation area that occupies the entire ground-level portion. 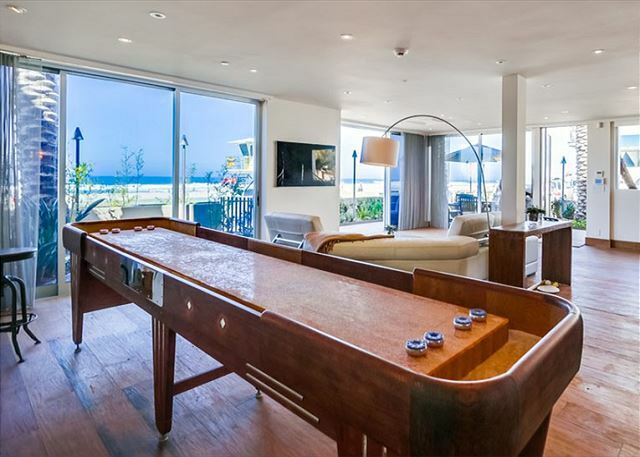 Included on this level is the impressive tequila bar with LED lighting, a mini-gourmet kitchen, as well as a ping-pong table and shuffleboard. This area is also considered the fourth bedroom with a Queen sleeper sofa with full separating partition for privacy. 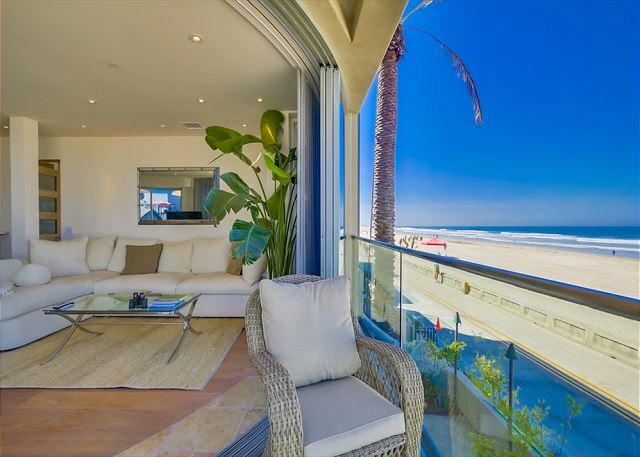 Large retractable glass panels provide a perfect opportunity for the interior to take full advantage of the oceanfront living environment found on the exterior. Contiguous to the entertainment/recreation room, there is a much larger than normal patio area offering approximately 1000 square feet to relax and entertain family members.The patio is fully gated with a lush grassy area on one side and a private gas fire pit area surrounded by soft and luxurious sand on the other. 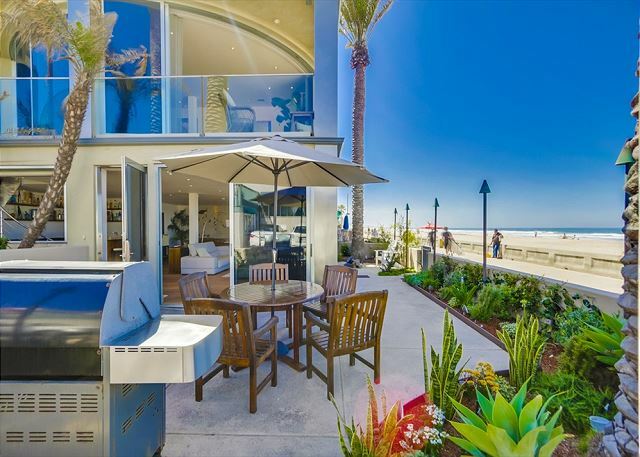 At dusk, grab your favorite cocktail and put some steaks on the grill or merely gather around the fire pit as the sun melts into the ocean. As the warmth of the gas tiki torches gently welcome the evening with the massive palms overhead, you will begin to believe you are truly experiencing a moment in time that you would normally only find in a more tropical setting. 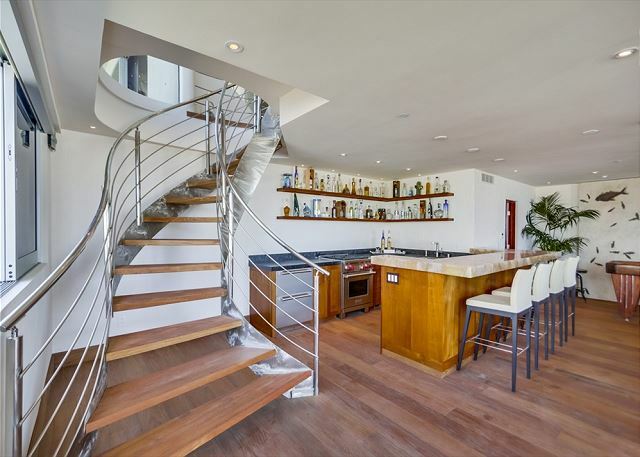 In short, this extremely unique townhome provides a very rare opportunity to live the "Lifestyle of the Rich & Famous"! The Mission Beach and Mission Bay vacation communities are centrally located in San Diego for easy access to San Diego County's most popular attractions including SeaWorld, the World Famous San Diego Zoo, Balboa Park, Seaport Village, La Jolla, Ocean Beach, Downtown San Diego, Coronado, Del Mar and much more. 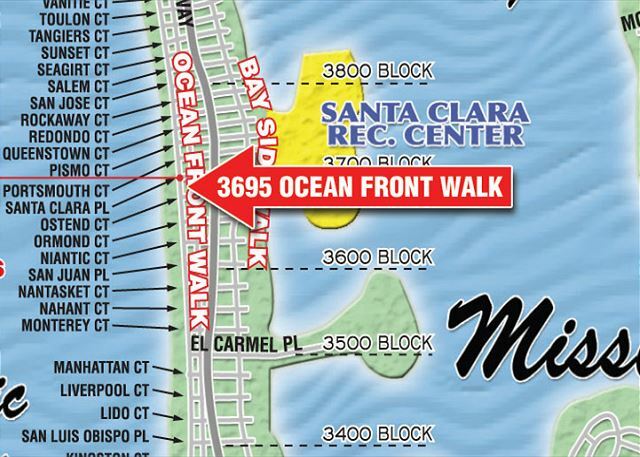 Bicycle, surfboard, beach chairs and toys are available for rent within walking distance. Also sailboat, powerboat, jet ski rentals and action sports activities are located within the Mission Beach area. 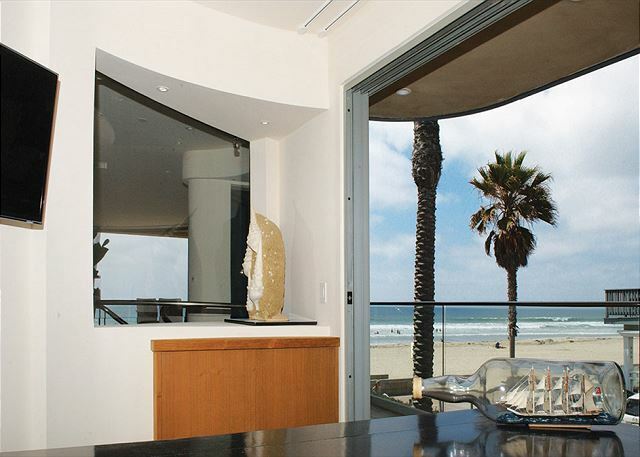 At San Diego Vacation Rentals we strive to provide our guests with the best vacation experience. Our team is always available to assist in any way possible from the reservation process to your stay with us and beyond. Please contact us with any questions. 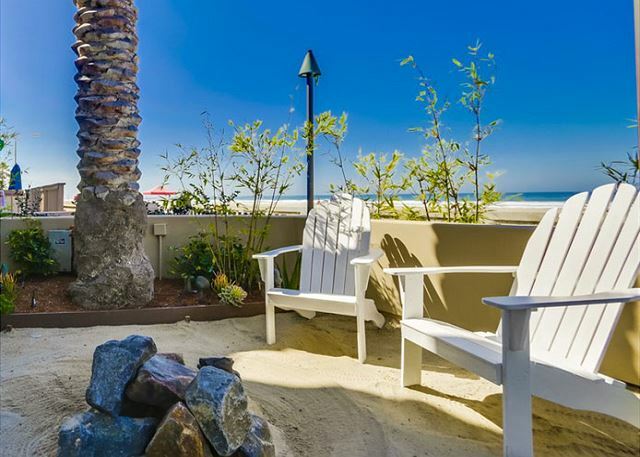 Rooms Sleeps 7, All bedrooms have ocean views and private bathrooms. The office is a sanctuary with ocean view. 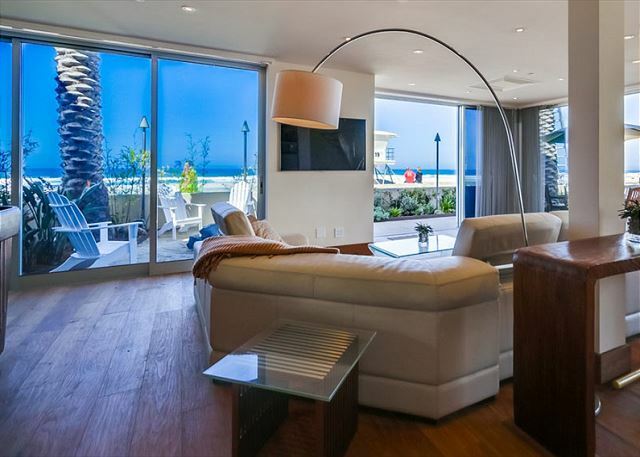 The master bedroom is ocean front with large glass walls that can fully open. 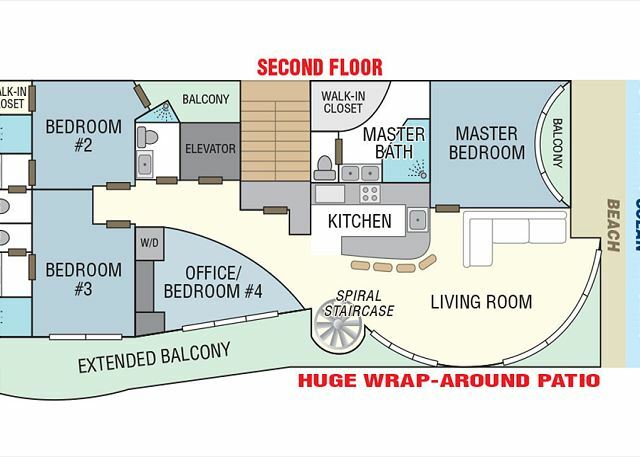 The lower level living room has a Queen sleeper with full partition for privacy. The house is top notch. It was pricey for 3 nights so I expected it be nice , and it exceeded my expectations!! We will definitely stay here again! Great experience. Property as described. Great location with lots of things close by. What a fabulous week we've just had in this beautiful property. This is one of the best, if not THE best, Beach Houses along the entire Boardwalk. 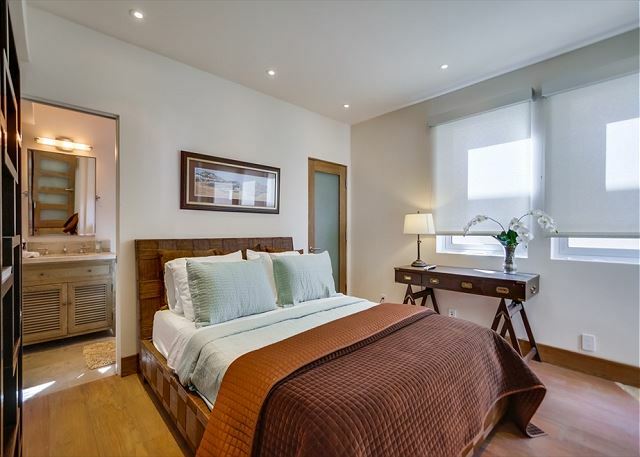 It is extremely well maintained, spacious and luxurious yet comfortable and homely. It was a perfect place to meet our 2 sons (aged 20 and 22) for a truly memorable Fall Break. I couldn't have picked a better place to stay and feel very privileged to have 'lived the dream', if only for a week. Property was mostly as I expected it. Location is amazing. Love the view. This was my first rental so not completely sure of what to expect. I was disappointed in the air conditioning. It did not work well. Given the price of this property, they should upgrade it. Did not like the Direct TV with it's limited channels. For an extra $100 per month, you'd have the full lineup but honestly we didn't spend a lot of time watching TV. But again, why not spend a few extra bucks on this beauty. It's a very active area which I love. From about 5am till about 3am, there will be people on the boardwalk. So almost all the time. Again, that's fine with me but if you want privacy, this is not the place for you with being all windows. Would I rent here again, maybe. I think I'd try something a little less expensive first. Owner and management team were great to work with. If you have a question, just ask them. I'd say they were very honest and straightforward. Oh, one more thing. DO NOT GET AN SUV. It will not fit in this garage. This place was absolutely outstanding. We have stayed in Mission Beach a few times now. If you are unfamiliar with the area, it is phenomenal for an active family holiday. 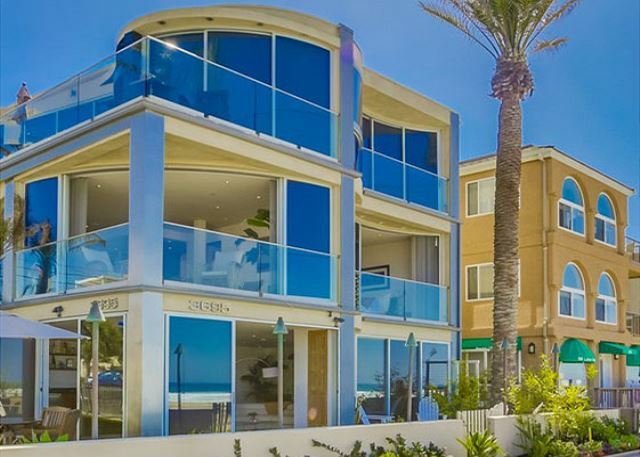 3695 Ocean Front is spectacular. Beds and gorgeous high end kitchen on second floor, ground floor was so much fun. 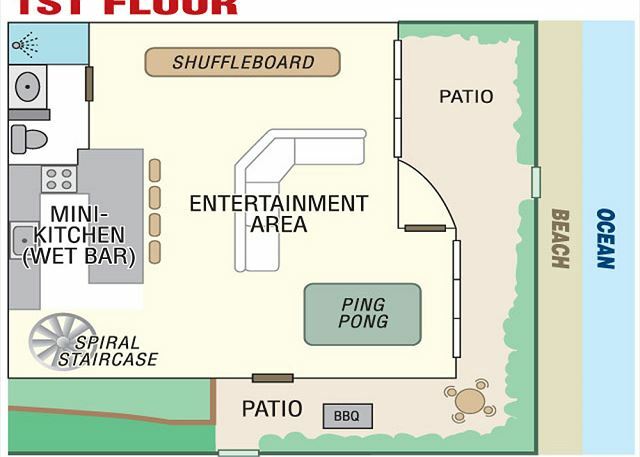 Bar, ping pong and shuffleboard, with huge glass doors that open to one of the most interesting and special places in America. Everything was spotless, and top dollar was spent in every corner. 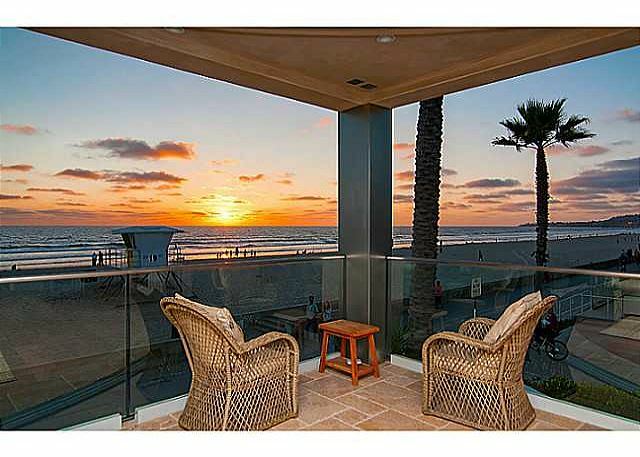 My daughters (14 and 10 years old ) and I reserved this beautiful Rental home in order to experience San Diego for the first time ever. The location was amazing for kids of this age as we had the Park at Mission Bay and the Bay right in walking distance. Their was so much to do and they never were bored. In addition, the comforts of this home surpassed all of our expectations. The attention to detail, views and comfortable accommodations were more than expected. What added to this was the air conditioning which if you have ever rented by the beach is extremely rare but a great comfort on the two rainy humid days we experienced. I would recommend this home to any family with teens or tweens as the amount of activity was fantastic and the location perfect.